Born in Reading, Cooper was discovered by Argyle scout Micky Hill and joined as an apprentice alongside the likes of John Uzzell and Kevin Hodges. He started out as a left midfielder, making his first team debut in November 1979, and with consistently busy and energetic displays, established the position as his own in the early 1980s. The arrival of John Hore as Argyle manager in 1983 saw his status elevated when he became one of the youngest skippers in the League at the age of 22. A few months later he led out the Argyle team in the 1984 FA Cup semi-final; however it was his stray pass that led to Watford scoring the only goal of the game. A miserable run of form in the following season saw Cooper become the target of the Home Park boo-boys, but manager Dave Smith stuck with him and converted him to left-back. This rescued his career at Argyle and he adapted to the new position with great ease. Cooper spent two successful seasons in the second tier following promotion with Dave Smith's side. During his time at Home Park, he played for a remarkable nine managers, starting with Bobby Saxton in 1979 and ending with David Kemp in 1990. 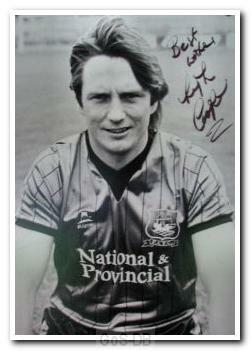 His consistency and loyalty was rewarded by a testimonial match; on a Friday evening in August 1988, eight days before the start of the new season, 5,027 turned out to see Argyle beaten 2-1 by Coventry City, with Tommy Tynan scoring Argyle's goal. Having made the left-back position his own, disaster struck barely three months into the 1988-89 season. After 15 games, Cooper broke his leg in an away match at Portsmouth, the injury requiring six minutes of treatment on the pitch before he could be stretchered off. 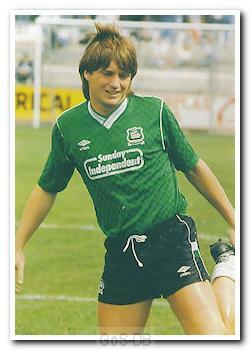 The break effectively ended his Argyle career, with 400 appearances in sight and still only 27. After 15 months out of action he played only two more first team games before joining Aldershot in 1990, where he added 33 more League appearances until serious financial difficulties forced the club to fold in March 1992. He then returned to the Westcountry to play for Truro City, but his playing career was ended by another broken leg. Cooper went on to manage a number of local clubs, including Truro City, Holsworthy, Saltash United, Liskeard Athletic and Launceston. He is still a familiar face at Home Park, with occasional guest appearances at the Green Taverners' Fan Fest and the 50-50 draw at half-time.